Mosta was in the direct flight path of enemy bombers retreating from or heading to the RAF base at Ta Qali. As a result the town was heavily bombed in the first four months of 1942, and civilian casualties were high. Never before had their faith been more important to the people of Mosta. 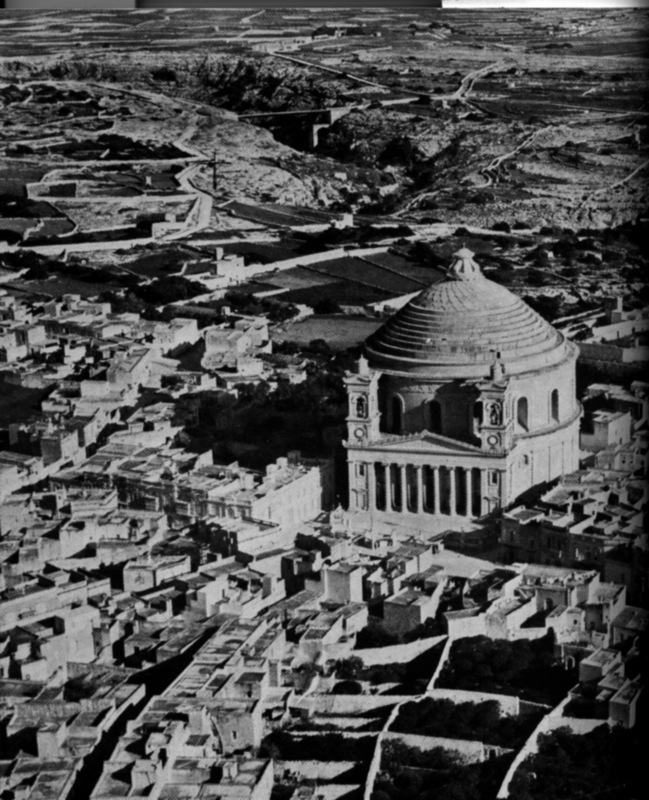 At 1600 hours on Thursday 9 April 1942 Mosta’s parishioners were assembled beneath the beautiful Rotunda of St Marija Assunta for the daily hour of prayer. At the sound of the air raid alarm, many headed for shelter; some preferring to remain in one of the side chapels to pray. At approximately 1640 hours a 500kg Luftwaffe bomb pierced the dome, smashed into masonry and clattered to the stone floor. It did not explode. The shocked parishioners were ushered out of the Church to safety and no-one was hurt. A report was telephoned through to Royal Engineers Bomb Disposal of an unexploded bomb in a priority location: inside the Rotunda at Mosta. This designation meant it must be dealt with immediately and personally by one of the two RE Bomb Disposal Officers, Lt T W T Blackwell or Lt G D Carroll. The disposal of the unexploded bomb at Mosta on 9 April 1942 is logged in the official War Diary of the Royal Engineers Bomb Disposal as UXB report No 2175: priority; 500kg, defuzed and removed. A second bomb was reported on arrival, a 50kg was added to the report as UXB No 2175 (a), defuzed and removed. This is not the bomb which penetrated the Rotunda in Mosta. For many years the photograph was believed to show the actual unexploded bomb removed from the church. 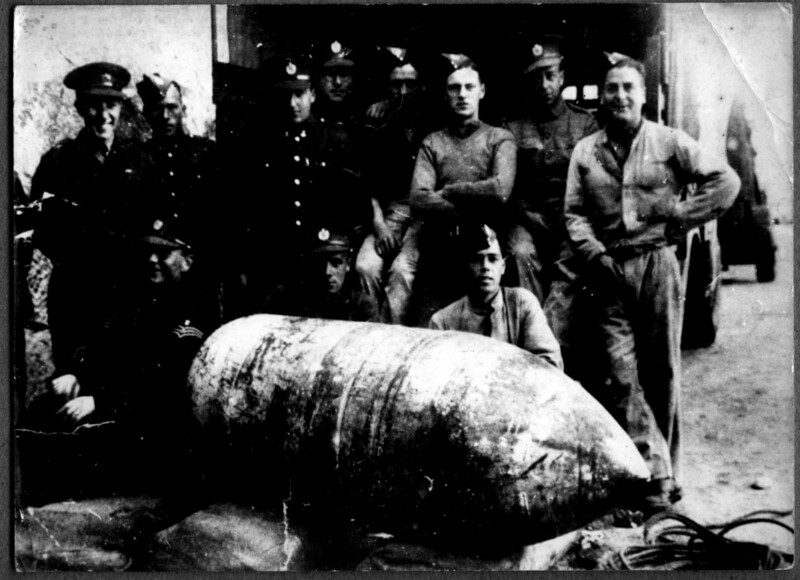 However, it was taken in January 1941 and shows the Royal Engineers Bomb Disposal Section with a 1000kg bomb. 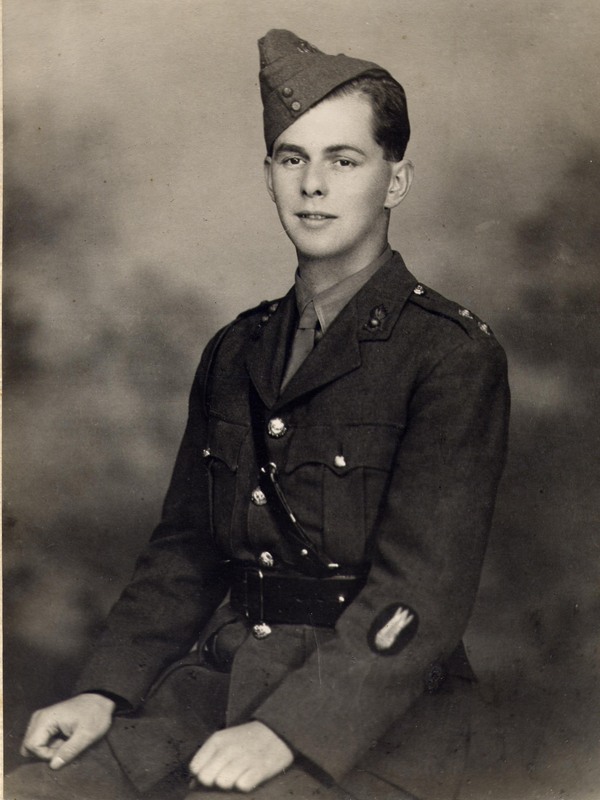 The BD Officer, Lt E E C Talbot (pictured left) was killed in October 1941. The UXB removed from the church on 9 April 1942 was a 500kg German high explosive. Contrary to rumours, it was not full of sand and did not contain a message of greeting. It was a live bomb, and was defuzed and removed: all such neutralised bombs were taken to the west coast of Malta and dumped in the sea. The bomb on display in the church today is not the original one but a similar example. Many who served in Malta during World War 2 have been drawn to return in recent decades. They often identify strongly with Mosta, so much so that some believe they were present on that day in 1942. According to several sources, former RAF and Army servicemen from a range of regiments have stated that they shepherded the congregation out to safety, others that they picked up the bomb and carried it out of the church. So who dealt with the Mosta bomb? Unfortunately no-one can identify with certainty who tackled the unexploded bomb in the Rotunda, except that it was a Royal Engineers Bomb Disposal Offficer. 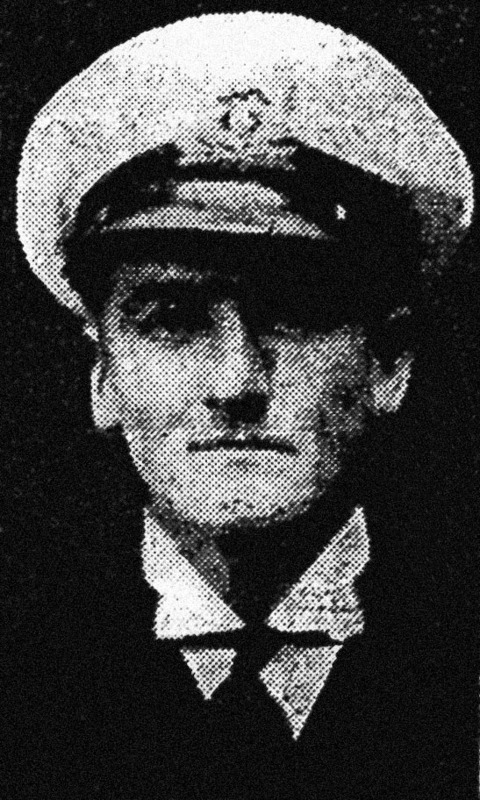 The bomb was then removed by members of the BD squad and dumped in the sea. For them, arriving after people had been led out of the church by their priests, there was no sense of a miracle at the time – this was just one of the many unexploded bombs they were tackling all over the Island in those weeks of intense bombing. However, the unexploded bomb commemorated at Mosta represents over 7000 unexploded bombs dealt with by the RE Bomb Disposal Sections in two years. 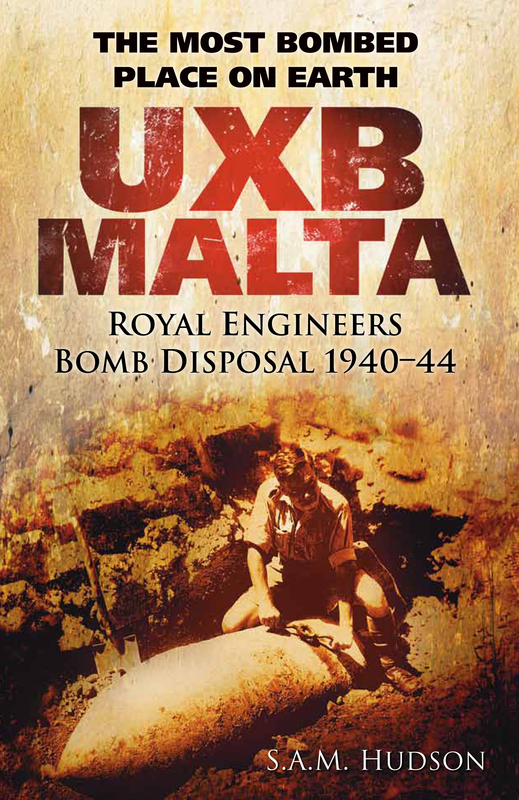 The real story of the men who dealt with the Mosta bomb is uncovered in UXB Malta, S A M Hudson, History Press 2010/2011.